They’re magnificent and majestic, generally easy going and easily taken advantage of. As large and as intimidating as they once were, whales have come a long way in our cultural and societal portrayals and understandings. As main characters of legend, myth and tall tales across the globe, whales were mistaken for islands in The Thousand and One Nights, the Talmud, and even ancient India and Persia by sailors. Whales have also supposedly swallowed and regurgitated a number of men, including Jonah of the Bible and Bully Sprague who used tobacco to incite the whale’s vomiting. Siebert explores the overhunting of whales and the decimation of their populations, the development of whale science – including the recordings of their sounds and songs – and the discoveries made on whale physiology, social interactions and intelligence. Who knew that whales have many more spindle cells than us, which indicate the capacity of knowing right versus wrong and expressing love and compassion? 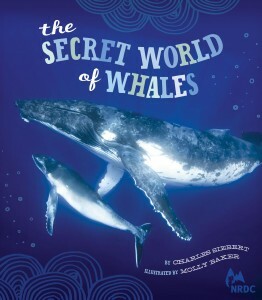 He chooses a select few instances to share with young readers the most moving ways in which whales have connected with humans. Wrapping up this investigate text is a chapter on “Our Noise in Their World,” in which one learns the whale fatality caused by Navy sonar testing and the use of air guns in detecting deep-water oil reserves. With endearing cartoon illustrations from artist Molly Baker and historical and contemporary photographs, the aptly named The Secret World of Whales is a jewel in the sea of children’s non-fiction that usually doesn’t critique exploitative practices so openly nor so eloquently.